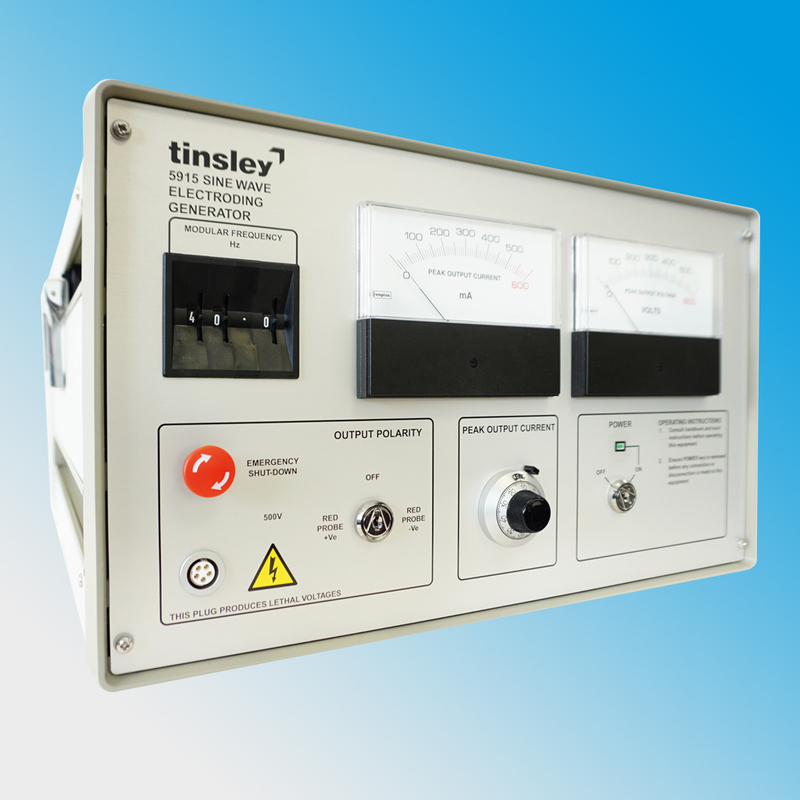 The Tinsley Electroding Generator, type 5915, has been developed with British Telecom to locate Submarine Telephone Cables. The method employed is the well established electroding technique. The unit is self-contained, desk top mounting, enabling tests to be carried out without the power feed connected to the cable under test. The 5915 Tinsley Electroding Generator is intended as an aid to cable repair ships in locating and identifying telephone cables. The Electroding Generator energises the Submarine Cable with a low frequency sine wave signal of up to 500mA at 500 Volts peak to peak. The Electroding Generator is located in the terminal station normally nearest to the fault area and connected to the cable under test by means of two safety probes built-in the instrument. The Electroding Generator is a low frequency oscillator with a sine wave output capable of delivering up to 500mA at 500 Volts peak to peak at any frequency from 5Hz to 99.9Hz. The frequency is selected by digital thumbwheel switches, peak current is set via a front panel rotary control. The Current and Voltage levels are clearly displayed on Front Panel Precision Analogue Meters. The current waveform is controlled to be sinusoidal. The test current has a DC bias to improve the sensitivity detection over longer distance. The test current can be applied in either the forward direction only or in the reverse or forward bias, as required. Longer cable can normally be electroded by energising in the reverse direction. A crystal controlled oscillator ensures that the frequency does not drift while testing is in progress. Output connections are made by permanently connected probes, which are fully shrouded. A safety circuit disables the Generator output whilst the probes are being applied to the cable under test. A special compartment on the rear of the instrument is provided for stowing the output probes when not in use. A frequency monitor point (square wave at signal frequency) is provided on the rear on the instrument. Output level is TTL compatible. Watch our new movie to see the features and benefits of our 5915 Sine Wave Electroding Generator. Tinsley" width="100%" height="239" allowFullScreen> 5915 Signal Generator Preview. from Tinsley" width="100%" height="239" allowFullScreen> Instrumentation on Vimeo. 5Hz to 99.9Hz, selected in 0.1Hz steps. 0.03% Long term (12hr). 0.003% Short term (10min). Adjustable by thumbwheel edge switches. 105V to 125V or 210V to 250V; 50Hz to 60Hz, (selected via rear panel). Power applied by operation of a key switch. Key is removable in the "OFF" position only. Mains input circuit is fused. Input is via I.E.C. socket. 300H x 512D x 470W (mm) approx.